Multilineage dysplasia in greater than 50% of at least two cell lineages in the absence of NPM1 or biallelic CEBPA mutations. 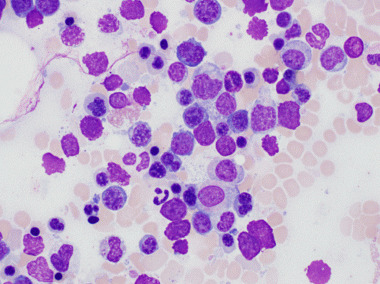 In new cases of AML, careful review of the patient's history to identify a previous diagnosis of myelodysplastic syndrome (MDS) or myelodysplastic/myeloproliferative neoplasm (MDS/MPN) and to exclude prior exposure to cytoxic treatments (chemotherapy and radiation) is necessary for proper classification. The list of AML-MRC-related cytogenetic abnormalities is shown in the section under "Molecular/Genetic Features and Methods." Patients with acute myeloid leukemia (AML) with myelodysplasia-related changes (AML-MRC) often present with severe pancytopenia. Cases arising in association with an myelodysplastic syndrome (MDS) or myelodysplastic/myeloproliferative neoplasm (MDS/MPN) as well as those arising in childhood may be slowly progressive. 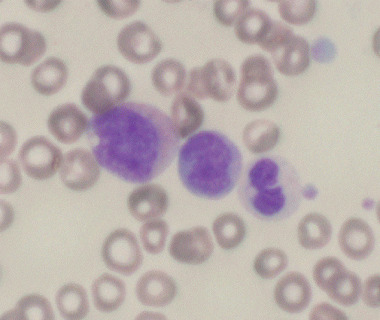 Dysplastic promyelocyte with cytoplasmic vacuole (left), blast (center), and dysplastic neutrophil with pseudo-Pelger-Huet anomaly and hypogranularity (right). 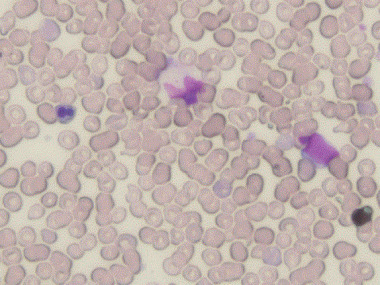 Dysplastic neutrophil with large pseudo-Chediak-Higashi granules. Features of dyserythropoiesis include megaloblastoid forms, nuclear budding, irregular nuclear contours, nuclear fragmentation, multinucleation, karyorrhexis, mitoses within erythroid forms, ring sideroblasts, and cytoplasmic vacuolization (see the following images). 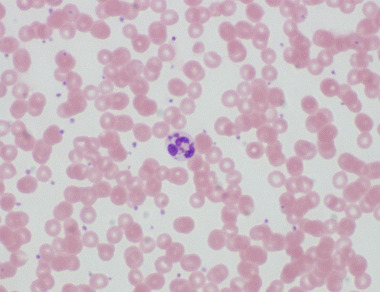 A dysplastic red blood cell with budding nuclei (left) is seen with a monocyte (center), and a blast (right). Numerous dysplastic erythroid cells are seen including nuclear budding, irregular nuclear contours, and multinucleation. Features of dysmegakaryopoiesis include small size, nuclear hypolobation, nuclear hypersegmentation, and separated nuclear lobes (see the image below). 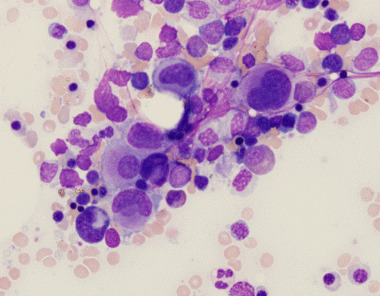 A cluster of dysplastic megakaryocytes is seen. Several small and hypolobate megakaryocytes are present. Rare cases of AML-MRC demonstrating basophilic differentiation  or mixed-lineage phenotype  have been reported. Immunohistochemical staining of the bone marrow biopsy specimen may be especially helpful in cases with increased fibrosis and an inadequate aspirate specimen. In AML-MRC, CD34 and/or CD117 immunostains reveal numerous (>20%) blasts which often form large clusters and sheets. In cases emerging from a preexisting myelodysplastic syndrome (MDS), these stains may also highlight increased blasts located away from the bony trabeculae (atypical localization of immature precursors [ALIP]). PIGN gene expression aberration appears to be associated with genomic instability and leukemic progression in AML-MRC. This gene may play an essential role in regulating mitotic integrity to maintain chromosomal stability and preventing leukemic transformation/progression. The lack of prognostic significance of multilineage dysplasia in AML with mutated NPM1 or biallelic CEBPA mutations [1, 7, 8] support the 2016 World Health Organization (WHO) updated classification of not including these entities within the spectrum of AML-MRC, even if morphologic dysplasia is present. What are the diagnostic criteria for acute myeloid leukemia (AML) with myelodysplasia-related changes (AML-MRC)? According to the WHO Classification of Tumours of Haematopoietic and Lymphoid Tissues, what does acute myeloid leukemia (AML) with myelodysplasia-related changes (AML-MRC) encompass? How is acute myeloid leukemia (AML) with myelodysplasia-related changes (AML-MRC) defined? What are the clinical features of acute myeloid leukemia (AML) with myelodysplasia-related changes (AML-MRC)? What are the morphologic features of acute myeloid leukemia (AML) with myelodysplasia-related changes (AML-MRC)? What are the immunophenotypic features of acute myeloid leukemia (AML) with myelodysplasia-related changes (AML-MRC)? What are the cytogenetic abnormalities associated with acute myeloid leukemia (AML) with myelodysplasia-related changes (AML-MRC)? What is the prognosis of acute myeloid leukemia (AML) with myelodysplasia-related changes (AML-MRC)? Arber DA, Stein AS, Carter NH, Ikle D, Forman SJ, Slovak ML. Prognostic impact of acute myeloid leukemia classification. Importance of detection of recurring cytogenetic abnormalities and multilineage dysplasia on survival. Am J Clin Pathol. 2003 May. 119 (5):672-80. [Medline]. Haferlach T, Schoch C, Loffler H, et al. Morphologic dysplasia in de novo acute myeloid leukemia (AML) is related to unfavorable cytogenetics but has no independent prognostic relevance under the conditions of intensive induction therapy: results of a multiparameter analysis from the German AML Cooperative Group studies. J Clin Oncol. 2003 Jan 15. 21 (2):256-65. [Medline]. Miyazaki Y, Kuriyama K, Miyawaki S, et al. Japan Adult Leukaemia Study Group. Cytogenetic heterogeneity of acute myeloid leukaemia (AML) with trilineage dysplasia: Japan Adult Leukaemia Study Group-AML 92 study. Br J Haematol. 2003 Jan. 120 (1):56-62. [Medline]. Yanada M, Suzuki M, Kawashima K, et al. Long-term outcomes for unselected patients with acute myeloid leukemia categorized according to the World Health Organization classification: a single-center experience. Eur J Haematol. 2005 May. 74 (5):418-23. [Medline]. Vardiman J, Reichard K. Acute myeloid leukemia with myelodysplasia-related changes. Am J Clin Pathol. 2015 Jul. 144 (1):29-43. [Medline]. Diaz-Beya M, Rozman M, Pratcorona M, et al. The prognostic value of multilineage dysplasia in de novo acute myeloid leukemia patients with intermediate-risk cytogenetics is dependent on NPM1 mutational status. Blood. 2010 Dec 23. 116 (26):6147-8. [Medline]. Bacher U, Schnittger S, Macijewski K, et al. Multilineage dysplasia does not influence prognosis in CEBPA-mutated AML, supporting the WHO proposal to classify these patients as a unique entity. Blood. 2012 May 17. 119 (20):4719-22. [Medline]. Deschler B, Lübbert M. Acute myeloid leukemia: epidemiology and etiology. Cancer. 2006 Nov 1. 107 (9):2099-107. [Medline]. Arber DA, Carter NH, Ikle D, Slovak ML. Value of combined morphologic, cytochemical, and immunophenotypic features in predicting recurrent cytogenetic abnormalities in acute myeloid leukemia. Hum Pathol. 2003 May. 34 (5):479-83. [Medline]. Pedersen-Bjergaard J, Christiansen DH, Andersen MK, Skovby F. Causality of myelodysplasia and acute myeloid leukemia and their genetic abnormalities. Leukemia. 2002 Nov. 16 (11):2177-84. [Medline]. Bahmanyar M, Chang H. Acute myeloid leukemia with myelodysplasia-related changes demonstrating prominent basophilic differentiation. Blood. 2016 May 19. 127 (20):2503. [Medline]. [Full Text]. Kajal B, Chang H. Acute myeloid leukemia with myelodysplasia-related changes demonstrating mixed-lineage phenotype. Blood. 2016 Sep 22. 128 (12):1663. [Medline]. [Full Text]. Weinberg OK, Hasserjian RP, Li B, Pozdnyakova O. Assessment of myeloid and monocytic dysplasia by flow cytometry in de novo AML helps define an AML with myelodysplasia-related changes category. J Clin Pathol. 2017 Feb. 70 (2):109-15. [Medline]. Teye EK, Sido A, Xin P, et al. PIGN gene expression aberration is associated with genomic instability and leukemic progression in acute myeloid leukemia with myelodysplastic features. Oncotarget. 2017 May 2. 8 (18):29887-9905. [Medline]. [Full Text]. Fernandez-Pol S, Ma L, Ohgami RS, Arber DA. Immunohistochemistry for p53 is a useful tool to identify cases of acute myeloid leukemia with myelodysplasia-related changes that are TP53 mutated, have complex karyotype, and have poor prognosis. Mod Pathol. 2017 Mar. 30 (3):382-92. [Medline]. Huck A, Pozdnyakova O, Brunner A, Higgins JM, Fathi AT, Hasserjian RP. Prior cytopenia predicts worse clinical outcome in acute myeloid leukemia. Leuk Res. 2015 Oct. 39 (10):1034-40. [Medline]. Yabe M, Tang G, Garcia-Manero G, et al. Acute myeloid leukemia With t(v;5q33) is associated with poor overall survival and often lacks myelodysplastic features. Clin Lymphoma Myeloma Leuk. 2015 Jun. 15 Suppl:S85-90. [Medline]. Lopes MR, Pereira JK, de Melo Campos P, et al. De novo AML exhibits greater microenvironment dysregulation compared to AML with myelodysplasia-related changes. Sci Rep. 2017 Jan 13. 7:40707. [Medline]. [Full Text]. Dysgranulopoiesis: Vacuolization. Image courtesy of Rector and Visitors of the University of Virginia. Dysgranulopoiesis demonstrating Chediak-Higashi-like granules (arrow).